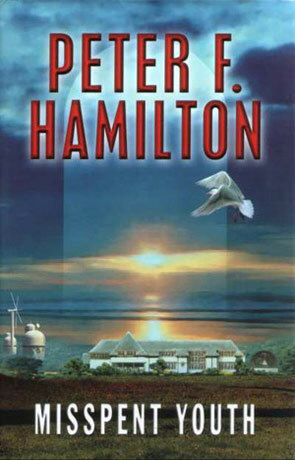 Misspent Youth is a stand alone science fiction novel by the acclaimed British author Peter F Hamilton. Misspent Youth – try saying it to your self – Misspent Youth, not exactly catchy is it?. It sound so much like a story about maladjusted working class youngsters in some large industrial town or the title of a Bruce Springsteen track. I’m still undecided on which idea is making me the most nauseous. Anyway, this is a Hamilton novel, so there’s a reason for the title and as it turns out it’s actually quite good. Misspent Youth takes place in an England where global warming has started to make it’s mark, where everything is controlled by Brussels, where personally owned cars is nearly a thing of the past, where copyright laws are a thing of the past. It’s a bit like Hamiltons earlier novels, but better thought out. Hamilton uses a fairly large part of the book describing this world, there’s some really interesting angles on things and I was especially liked the take on copyright law and the thoughts on what a United Europe could turn into. The really incredible thing that Hamilton manages to make these things important to the story, not just using the story as a sounding board for his opinions. At only a bit over threehundred pages in the hardcover version this is a rather short novel, compared to what we are used to from Hamilton, but I really don’t mind. It’s really nice to see an alternative to the eternal page creep that seem to be the norm in this business. Hamilton tells Jeff story from Tims angle, making this story Hamiltons strongest book to date. The real story is the rejuvenation story, but by telling it through Tim, we get a much better view of the dark side of the ultimate prize. Tim is so incredible real, he may not be Hamiltons strongest character ever, but he is definitely the one that I’ve felt the most for. Written on 4th March 2002 by TC.